Assembly of First Nations National Chief Perry Bellegarde speaks with a delegate during the AFN annual general assembly in Vancouver on July 26, 2018. First Nations communities present for the gathering included a mix of those in support of the pipeline expansion and those opposed. Perry Bellegarde, newly re-elected as national chief of the Assembly of First Nations, says he won’t directly mediate between members who are divided over the expansion of the Trans Mountain pipeline, instead leaving it up to individual communities and title holders to take their own stands on the project. “One of the most important rights, because we have that right to self determination, is the right to say ‘yes,’ and the right to say, ‘no,’” Mr. Bellegarde said in an interview on Thursday. “It’s not up to the AFN national chief or the executive or any body within the AFN to try to dictate that. It’s the rights and title holders that will make that determination." The federal government has purchased the pipeline and its expansion project between Alberta and British Columbia, prompting massive protests and legal action. While the pipeline has angered environmental groups, it has also outraged some First Nations along its route. Hundreds of AFN delegates gathered in Vancouver this week for the annual general assembly of the organization, which, this year, included the election of a national chief. Mr. Bellegarde won a second three-year mandate over four rivals. He said opponents have nothing to fear from chiefs supportive of the pipeline. “Our chiefs that are very pro on the economy side will not do anything to jeopardize the land and the water,” he said. First Nations communities present for the gathering included a mix of those in support of the pipeline expansion and those opposed. During the gathering, the AFN’s national youth council issued a letter to the organization executive and chiefs requesting support in the fight against the pipeline. Mr. Bellegarde said the AFN has not entirely been on the sidelines, noting that it was granted intervenor status when the B.C. government went to the B.C. Court of Appeal to test whether bitumen can cross B.C. territory. “We want to make sure First Nations jurisdiction is respected and that our rights and title are respected as well – and, as well, the right to self-determination, including prior and informed consent,” he said. Without providing specifics, Mr. Bellegarde said full Canadian implementation of the United Nations Declaration on the Rights of Indigenous Peoples, as promised by the federal government, could help with the issue. UNDRIP requires signatories to obtain “free, prior and informed consent” from Indigenous communities prior to resource development in their traditional territories. Chief Jim Boucher of the Fort McKay First Nation in Alberta, which has supported the pipeline, said he had made some “new friends” among First Nations through a forum on investing in Trans Mountain held during the assembly earlier in the week. He said some B.C. chiefs opposed to the pipeline who attended the gathering were willing to have more discussions about the issue. Mr. Boucher said further forums will be held, including one in British Columbia, in coming months. Mr. Boucher said he appreciated Mr. Bellegarde’s approach to Trans Mountain. “I think it’s best for the Assembly of First Nations to remain neutral, with respect to ongoing site-specific issues such as the pipeline," he said in an interview on Thursday. But others were unhappy with Mr. Bellegarde’s approach. 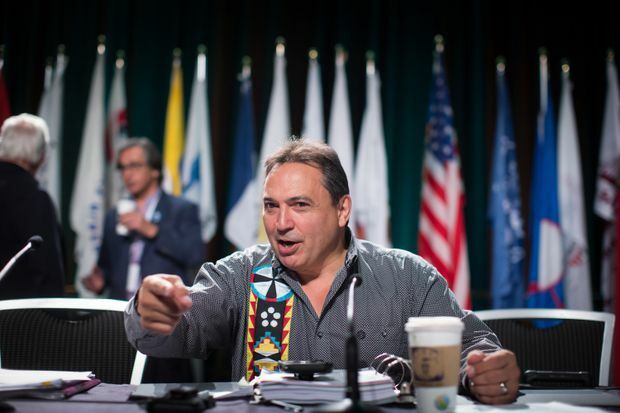 A representative of the AFN national youth council said in a statement that its membership was disappointed with Mr. Bellegarde’s position on its request, suggesting he should, at least, have had a discussion with the council about its concerns. “It is disheartening that he would disregard youth voices so soon after his election,” Darian Lonechild said in her statement.